I forgot some of you liked the box pleats in the first crafty tool belt. It goes together just like the crafty tool belt tutorial just the math, and of course the pleats are different. Measure the width you would like your apron to be (e.g. from hip to hip or a little wider). If this measurement is less than 19 inches follow Option B. If it is 19 inches or more follow Option A. **if you are unsure how much width you need, cut it wider. You can always trim off some of the width after you add the pleats and before you attach the double fold bias tape trim. Option A - Add 8 inches to your measurement. 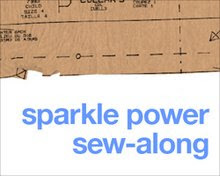 Cut your apron and trim piece to this width. Follow the directions for the original Crafty Tool Belt until it is time to pleat. Mark the centre of the apron with a pin. Measure 2 inches and 6 inches from the centre pin and mark those places too. Now fold the fabric so the 2 pins meet and pin. The extra fabric should be on the wrong side of your fabric. Flatten the pleat and even it out so the same amount of fabric is on either side of the pin. Repeat for the other side. Continue on with the Crafty Toolbelt Tutorial. Add 6 inches to your measurement. Cut your apron and trim piece to this width. Mark the centre of the apron with a pin. Measure .75” and 3.75” from the centre and place pins at these points. Now fold the fabric so the 2 pins meet and pin. The extra fabric should be on the wrong side of you apron. Flatten the pleat and even it out so the same amount of fabric is on either side of the pin. Repeat for the other side. Test fit and make sure you have enough fabric to attach the pockets (7.5” approx. on each side). If you don’t have enough you can make your pleat narrower. If your apron seems too wide, you can trim an even amount off each edge, just remember to maintain at least 7.5” on each side of the pleats to apply the pockets. Continue with the Crafty Toolbelt tutorial.